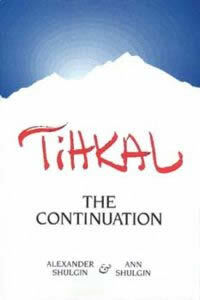 TiHKAL · info is a visual index and map of “ TiHKAL: The Continuation ,” by Alexander & Ann Shulgin. 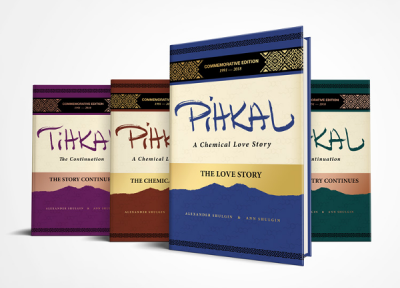 In TiHKAL the authors continue their exploration (begun in “ PiHKAL: A Chemical Love Story ”) of the chemistry and transformative power of psychedelic drugs, devoting this volume to tryptamines, β-carbolines, and LSD analogues. TiHKAL (the book) contains detailed reports on 55 substances and perhaps a hundred more are touched on. Still other tryptamines not discussed in the book are known or are suspected to have psychedelic potential. TiHKAL · info is my attempt to map out the terrain. trypt-amine\'trip-ta-,mēn\ n. [tryptophan fr. tryptic, fr. trypsin, fr. Gk. tryein, to wear down (from its occurence in pancreatic juice as a proteolytic enzyme) + amine fr. NL ammonia] 1: A naturally occurring compound found in both the animal and plant kingdoms. It is an endogenous component of the human brain. 2: Any of a series of compounds containing the tryptamine skeleton, and modified by chemical constituents at appropriate positions in the molecule. Get the new Commemorative Edition!